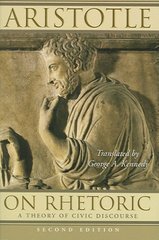 On Rhetoric 2 Edition This new edition of George A. Kennedy's highly acclaimed translation and commentary offers the most faithful English version ever published of On Rhetoric. Based on careful study of the Greek text and informed by the best modern scholarship, the second edition has been fully revised and updated. As in the first edition, Kennedy makes the work readily accessible to modern students by providing an insightful general introduction, helpful section introductions, a detailed outline, extensive explanatory notes, and a glossary of Aristotle's rhetorical terms. Striving to convey a sense of Aristotle's distinctive way of thinking, Kennedy preserves the meaning and technical language of the original text, explaining it in detail as opposed to simplifying it as other translations do.Updated and expanded in light of recent scholarship, the second edition features:* A revised introduction with two new sections: "The Strengths and Limitations of On Rhetoric" and "Aristotle's Original Audience and His Audience Today"* A more user-friendly format: running heads now include book and chapter numbers* An updated bibliography* Revised appendices that provide translations of new supplementary texts--Socrates' Critique of Sophistic Rhetoric; Lysias' Speech Against the Grain Dealers; two selections from Isocrates (from Against the Sophists and from the Antidosis); selections from Rhetoric for Alexander; and Demosthenes' Third Philippic--and an extensive revision of George A. Kennedy's essay "The Earliest Rhetorical Handbooks"